In conversation and on social media, empty nesters (those whose children have grown and left home) have sometimes assumed that their lives are the same as those of us who never had children. On a day-to-day level, this may largely be true, given that we have no dependents at home (unless of course we are caring for elderly relatives) and can have offices or TV rooms in our spare rooms, for example. But in truth the grief is different; the empty nester’s loss is for the past and what they had, not for the future and what they will never have. The (adult) children are still there – out in the world, living their lives (as they are supposed to be doing), (hopefully) making the empty nester proud of their independence and their achievements, keeping regular contact (mostly) with their parents, visiting on birthdays or special holidays or celebrating milestones together, or popping around to say hi if they live nearby. If an empty nester is ill or old, their child is almost certainly thinking of them, checking they are okay, and likewise, the empty nester still feels needed, in the case that their adult child may need practical or emotional help or advice. The empty nester has not had to endure the social isolation and judgement of not having children. Assuming being an empty nester is the same as my life is shallow; it ignores the reality of my life, the way we are treated by society, and diminishes what we have lost. I called this blog No Kidding in NZ, not only because I wanted a title that made it clear that I don’t have children, but also because I wanted a title that would keep me honest, and remind me every time I write that I can’t believe the myths, the negative voices, or those who just don’t get it. I don't kid myself that there’s a reason why I couldn't have children, that I deserved this, or that was unworthy. I don't kid myself that there is only one lifestyle in which we can be happy. I don’t kid myself that my life is better or worse than if I had become a parent; it is just my life. It’s a reminder I need from time to time, and I’m sure I could add to this list (if I had more than eight sentences), so please feel free to add your own reminders (to yourself, or to me) in the comments. 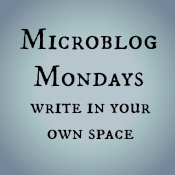 I have a number of posts brewing but none of them will be brief, so I have to confess that I have (temporarily, I am sure) lost my Microblogging mojo. So somewhat predictably, I’m resorting to a list of miscellaneous thoughts, which I am a little surprised to find are falling into the “ouch” category. Maybe it’s just time, and maybe this post balances out my more positive post on A Separate Life. Yet I feel guilty about that too, as I hate the reality of children growing up in poverty, and agree that this is an important issue. One of my elderly in-laws has been ill recently, and so – unlike any of the other siblings – we are feeling the full brunt of the responsibility that is on our shoulders. Of course it has raised issues, and we are talking to each other about how we will manage such situations when we are old, and hoping that we will recognise we should make changes in our lives before we actually need to. Last year, I was reading an article and at the end saw a selected list* of cognitive disorders. I was immediately struck by the similarities of these disorders with the thoughts and behaviour of those going through infertility, and those who are grieving post-infertility. 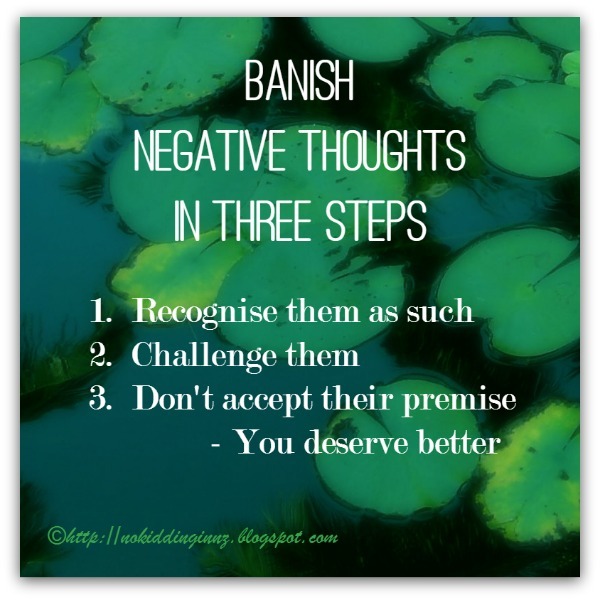 I’ve always found that recognising what I am doing and thinking is the first step to acceptance and change, so I thought it might be helpful to list these negative ways of thinking, along with examples of how our thoughts work against us, particularly for the infertile and involuntarily childless people (in the early years at least). Mind reading: You assume that you know what people think without having sufficient evidence of their thoughts. The infertile or the childless will often mind-read. We think people assume the worst about our situation and judge us, thinking that we didn’t try hard enough, or that we were somehow defective and shouldn’t be parents. Unfortunately we probably all have examples of people actually saying variations of these thoughts directly to us, or see them in the media, proving that that is what they were thinking. This leads to us imagining the worst about what people might say to us. I know I have. Fortune-telling: You predict the future negatively: things will get worse, or there is danger ahead. During infertility in particular, these fears are very real. And whilst there are many positive reasons for wanting children, I believe that as infertility becomes more and more real to us, fear drives us just as much as the desired outcome. Catastrophising: You believe that what has happened or will happen will be so awful and unbearable that you won’t be able to stand it. Unfortunately, our friends, family and wider society do everything they can to reinforce our catastrophising, so we have to look a little harder to find examples where our worst case scenarios don't end as a catastrophe. Fortunately, there are a growing number of No Kidding bloggers who are here to prove that our lives are not catastrophes! Labelling: You assign global negative traits to yourself and others. "I must have done something wrong to deserve this." Society so loves labels, that it is easy to buy into this. When we are feeling vulnerable, we also don't really question these assumptions. But we need to! Discounting positives: You claim that the positive things you or others do are trivial. "I'm not brave enough to end this journey without a child." 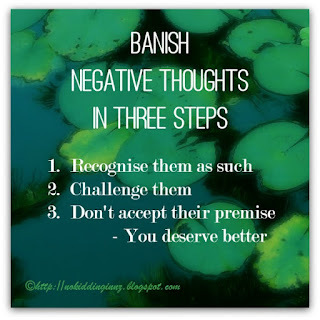 Positives so often seem to be a betrayal of our grief or our emotional distress, and so we discount them. A positive feeling even induces guilt, as if we don’t deserve to feel happy or grateful. Whereas they don't negate what we've been through, and they can show us how strong we've been to endure these stressful and disappointing experiences. Negative filtering: You focus almost exclusively on the negatives and seldom notice the positives. This is extremely common during infertility. Our infertility becomes our identity, and it can be hard to see what else is good in our lives. Likewise when we first learn we will be forever without children. Dichotomous thinking: You view events or people in all-or-nothing terms. This is very common when trying to conceive and during infertility treatments (or even when pursuing adoption). Our eyes are on the goal, and it is all or nothing. We surround ourselves (in the virtual world at least) with people who are cheering us on, and any suggestion that the goal is not the only option can be seen as a betrayal. What if? You keep asking a series of questions about “what if” something happens, and you fail to be satisfied with any of the answers. "What if my partner dies? I’ll be alone and sad and terrified." "What if I can't get pregnant? I'll never be happy again." "What if I can never accept this? I'll be miserable for the rest of my life." I think this is a variation of some of these other categories - negative filtering and catastrophising, in particular. The answers aren't satisfactory because they don't match with any of our preconceived notions that are driving us, or have driven us, for so long, and with such intense emotions. Emotional reasoning: You let your feelings guide your interpretation of reality. Even though there is ample evidence that people without children live positive, fulfilled lives, this isn't supported by the emotions we feel during infertility (or in early No Kidding mode), when they push us to extraordinary lengths (emotional, physical and financial) in pursuit of our goals. We then indulge in emotional reasoning to justify our actions and thinking (in exactly the way that parents might justify their choices when they are finding things hard). Inability to disconfirm: You reject any evidence or arguments that might contradict your negative thoughts. Consequently, your thought cannot be refuted. Providing evidence often doesn't help someone at this stage, because every fibre of their being is rejecting the premise that they will survive infertility, and that their lives can still be good without children. Their first instinct is to disagree, to refute. We see this in political debate too! I wonder if any of this sounds familiar? It certainly did to me! Recognising that I was doing do this was the first step to changing the way I thought. The benefit of time is that we gradually learn over the years how to dismiss these negative thoughts, or in some cases, to at least balance them out. I certainly have, and whilst I was prompted to really do this by my infertility and No Kidding status, I’ve found it a valuable lesson throughout my life. So if you haven’t seen it, I’ll finish on a more positive note by reposting this graphic. I was searching for an old No Kidding post the other day, and though I couldn’t find it (or I’d actually never written it anywhere other than in my head, perhaps), I did find another old post that had an aside that spoke to me again. It gave me an idea. I think I’m going to go through my blog here, from the very beginning, and reblog, or update, some posts. Maybe too I’ll develop a picture of the journey I’ve been on, and I’m interested to see if that matches the picture in my head of the healing process. Back to the thought that caught my eye a few days ago. I’d started thinking and talking at the time about the positives of this No Kidding life, and the gifts that my infertility and childless/free status had given me. 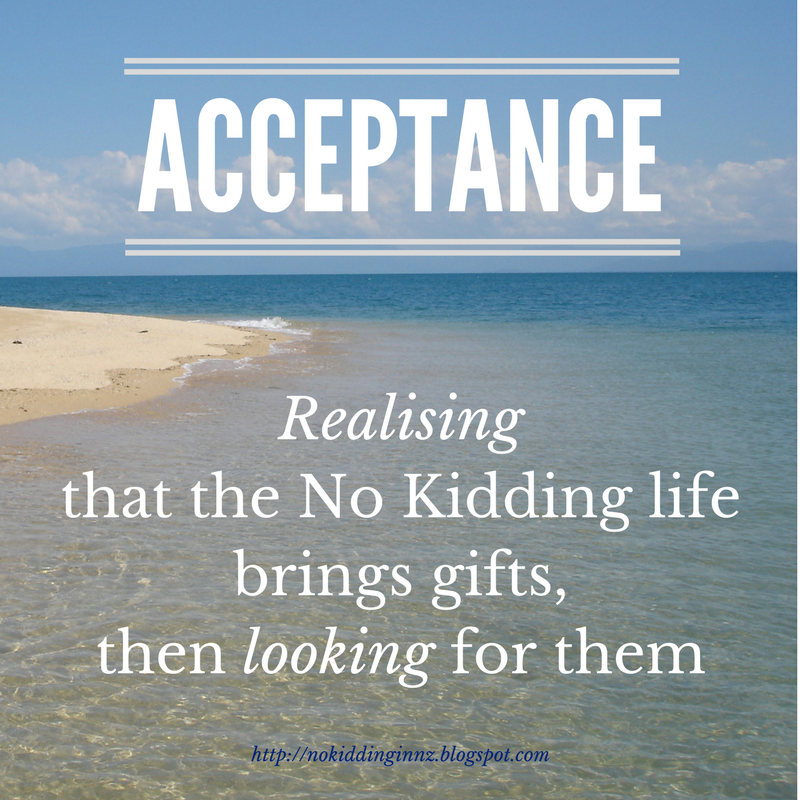 I’d also seen a lot of talk about acceptance, what it was, and why it was hard. 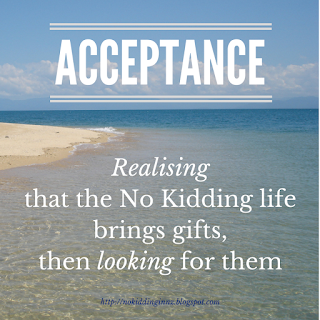 It’s so very common for those new to the No Kidding life to fight against acceptance, because they don’t really have a feel for what it actually is. But once we realise that our lives are not over and that we can begin to embrace them, then acceptance comes.